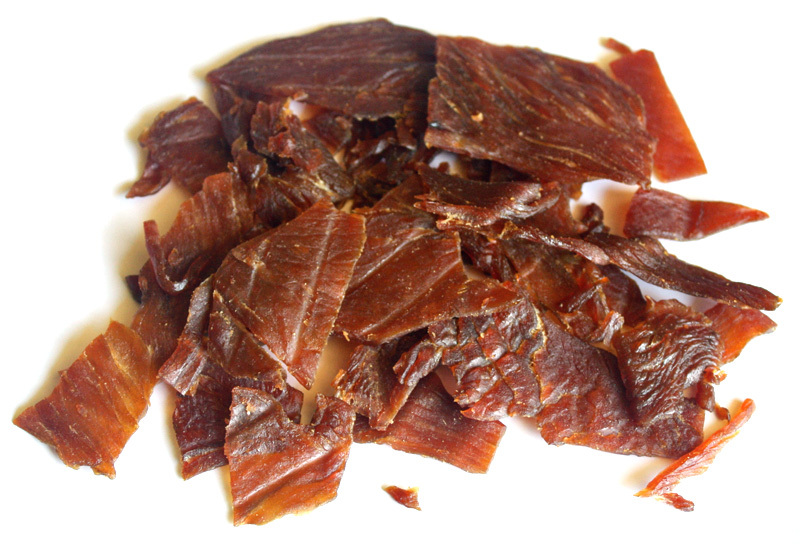 Pure Provisions is a brand of jerky that launched in 2013. It was founded by three college buddies, Matthew Gosselin, John Padlo, and Greg Stahl, who call Portola Valley, CA their company headquarters. The company was conceived when the three guys did a road trip from San Francisco to Boston, hopping from one national park after another and spending their nights in tents. They became accustomed to jerky for its long shelf life, easy packing, and high protein. So, they agreed to start a company focused on jerky for active outdoorsmen. 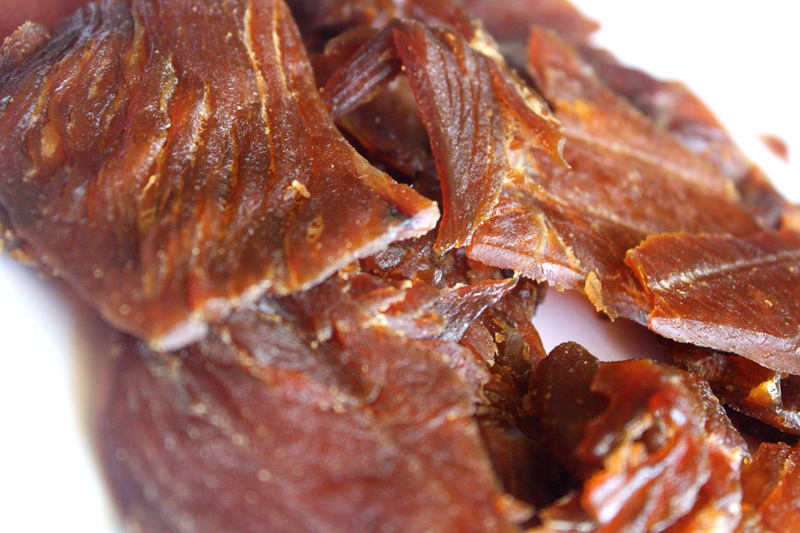 This Orange Ginger Turkey Jerky is their debut flavor. They describe as "Subtly flavored with the tang of orange and ginger", and as "a new twist on an old classic". The first flavor I taste is a moderate sweetness and a light saltiness. The chewing brings on hints of ginger and a touch of soy sauce. There's a fair amount of natural turkey meat flavor in the chewing, with more towards the end. For being labeled "Orange Ginger", it doesn't hold up well. I get a touch of the ginger, but none of the orange. If anything, there's a faint tanginess, but it doesn't register with any orange, citrus flavor. Instead, the flavors that define this jerky is largely a moderate sweetness and light soy sauce flavor. A touch of ginger lingers in the background, while the fair amount of natural turkey meat flavor is noticeable. It's very mild flavored, suitable for all taste tolerances. The meat consistency looks to be pure meat, with no tendon, fat, or unchewable tissues felt. It's quite flexible with a rubbery, plastic-like feel. It's soft, tender, and easy to eat. The chewing texture feels mushy and slightly gummy, not at all like eating real turkey breast meat. 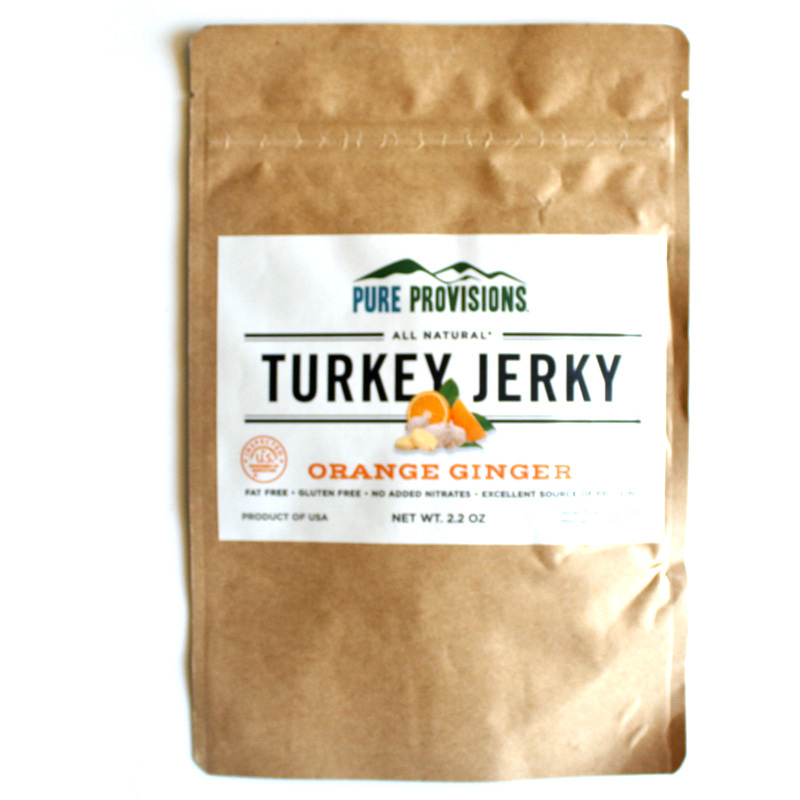 Verdict: This Orange Ginger Turkey Jerky from Pure Provisions doesn't really have any orange flavor, though offers a touch of ginger in the background. Otherwise, it's a simple, but clean tasting jerky with largely a sweetened soy sauce flavor, with the taste of turkey breast meat. For those reasons, it doesn't really rise above the other turkey jerky brands I've reviewed. It has that mushy, gummy chewing character like most sweetened, easy-to-chew jerky brands have, but it has all meat and no fat. Considering Pure Provisions wants to be a snack for active outdoors-people, it's target market is probably not going to be concerned about awesome flavor, and more about high protein, all natural ingredients, and light packing. It does pretty well there.